I am 7 months pregnant and I think only a very very small fraction of my family knows this… and all of this can be blamed on my inability to actually speak to any of them on the phone. I don’t know what it is about being on the phone but I just hate it. I never call them. I never call them BACK when they call me. I am a bad person. I blame technology (because really – why call when you can just e-mail?). 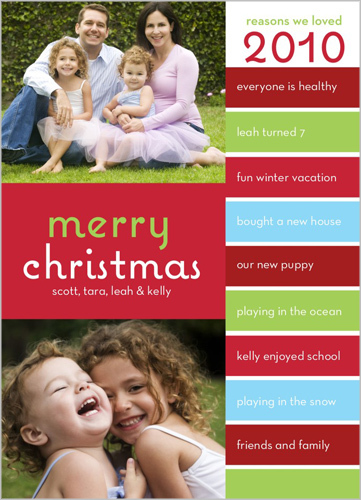 I love that this card is a fancier version of the “holiday letter”. 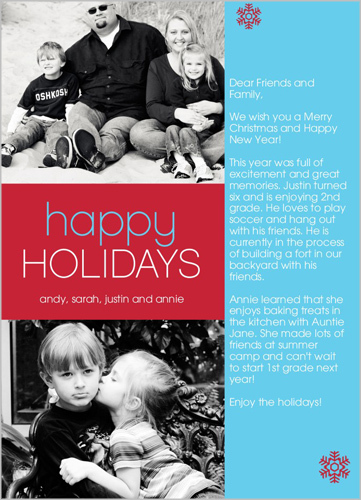 I’ve never actually written a holiday letter and am not sure I’d have much more to say than, “Can you believe it? I voluntarily and willingly decided it would be a great idea to push a watermelon out of my girly bits!” but I love the concept. I love this card too. It is a similar concept but instead of a formal letter, you just list out things that you loved about the year. I love that idea but don’t know if I have 10 things to list without sounding like a turd. But I’m also a little hesitant to send out a “Merry Christmas” card only because it seems more appropriate to say “Happy Holidays” these days. Although this could help get rid of the myth that I married into a Jewish family. For some reason, the majority of folks in my family thought I was marrying a Jewish guy just because of his last name (his family is not Jewish and they’ve argued that their last name is German). Hilarious! 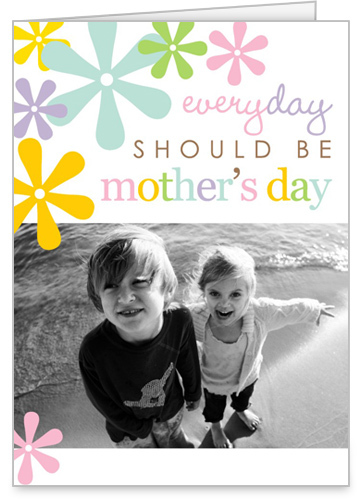 I like this card because you can add a short message and that is more my style. Plus we can have a pic of the dogs, a sonogram pic and then I guess whatever cheesy pic I can pull together of me & Jeremy. 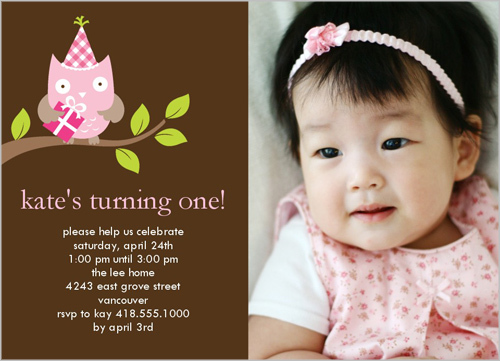 But then that got me thinking about all the future gifts and invites I can make through Shutterfly with a new baby! I vowed that I wouldn’t be THAT mom that only gifts items with pics of her child on them but I’m pretty sure I will fall into that trap (perhaps not to the point where I’m getting a tie printed with her image). I mean – how great would a calendar be? Their wall calendars actually let you add PERSONALIZED dates to them! This is perfect for my forgetful husband and my crazy parents (who I swear have removed their memories and replaced them with things related to the slot machines). And what about birthday invitations? OMG – an owl invite? I just died. And how cute is this card?! I couldn’t agree more, card… it really should be. So which card do you like the best? For those of you with family members spread across the country – how do you spread good news to them? I love the “reasons we loved 2010” card. You can incorporate a lot of events on that list, including your pregnancy. Also, I love doing photo cards for Christmas (even tho it’s just my husband and I) because the family loves them, and they don’t get thrown away so easily. Both of our moms have our card still up from last year. I promised not to be “that mom” too..and I swear that was not me that just bought my mom a fleece blanket with Holden’s face plastered all over it. That was totally someone else. 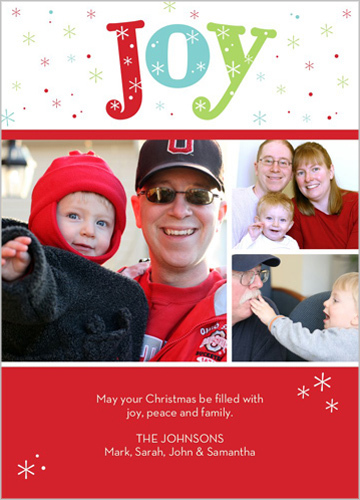 I usually use Shutterfly for holiday cards. I’m waiting for a kickass coupon to come through before I order. Hoping that’s soon because they’re ready to go!